2018-05-01T09:07:19.506Z ERROR upgrade_commands Current deployment size is too small for the existing inventory. 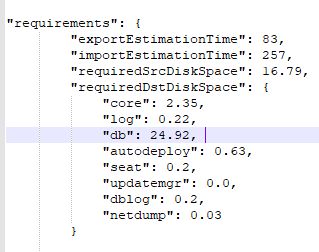 An odd thing to note, the GUI error references the word ‘core’ , but I assume it is not referring to the mount point /storage/core, because as you can see from the above logs, it was very clearly the DB import requirement that failed. In one of the upgrade logs, you can also find a summery of what the upgrade process has found it needs in the form of disk sizing, based on your source vCenter. 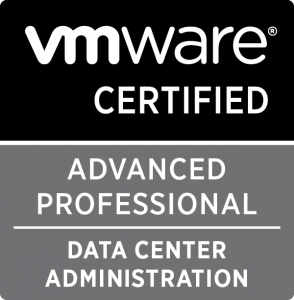 But regardless, note that most of the partition sizes for your target VCSA are not always effected by the ‘sizing’ choice you can make at the start of Phase1. In this case, the sizing of ‘large’ was not enough to accommodate our database, which was just barely too large. But we didn’t want to deploy the entire the VCSA as ‘large’ or ‘x-large’ either. As William points out on his blog ( https://www.virtuallyghetto.com/2016/11/updates-to-vmdk-partitions-disk-resizing-in-vcsa-6-5.html ) , its quite easy to resize individual disks to suit your needs. In our case, after Phase1 was completed with the deployment of the OVA, we then resized just the disk for the database, VMDK6, to 50GB, and then we saw Phase2 would complete successfully.